COLOR(S):Black with white markings, red with white markings; may be tri-colored. 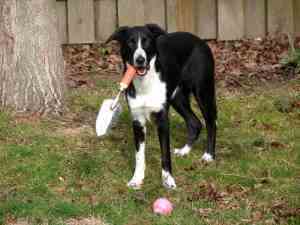 McNabs can vary widely, their shared roots are with the Border Collie. These dogs were developed by the Alexander McNab family in Mendocino, California, starting in the late 1800s from collies he brought from his native Scotland. The primary quality that these dogs are bred for is their herding ability; they are well known as cattle herders, but can herd other animals, such as horses, sheep, and llamas. McNabs are well-mannered dogs, hard-working, good personal hygiene, and friendly with small domestic animals such as cats and chickens, but they require extensive grounds in which to run and are happiest with a job to do. The McNab can also be an excellent deer and boar hunting dog. The Mcnab has a soft, dense, weather resistant double coat. Regular brushing of the McNab is recommended to remove loose and dead hair. Bathing should be done when necessary. This breed has no known health issues. The McNab requires a large amount of physical exercise and mental stimulation. They must have a job to do. This breed is not recommended for city or apartment living. The McNab will do best in a rural setting where there is lots of room to work, roam, and run. Early socialization and obedience is recommended. The McNab is intelligent and eager to please. McNab\'s will not respond to harsh or heavy-handed methods. Training must be done with firmness, fairness, patience, and consistency.